The Nokia of old was known to deliver handsets that were kind to the environment and it looks like HMD is continuing the tradition. If you’ve ever been interested in the materials and substances contained in your Nokia phone or what percentage of the packaging came from recyclable materials, the company now has you covered. 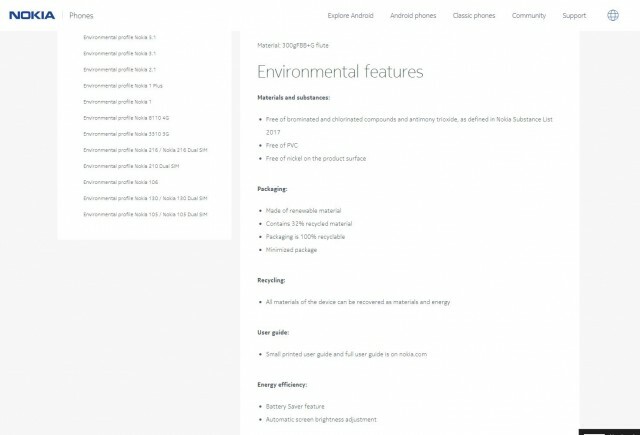 With the new environmental profile section, you can enjoy a detailed breakdown of select Nokia branded phones ranging from featurephones such as the refreshed 3310 and 8110 all the way up to smartphones like the Nokia 5.1. We noticed all the listed devices appear to be free of PVC and other harmful substances like nickel and bromine. HMD also claims 60% of the packaging on all devices is made up of recycled materials. Unsurprisingly, all phones appear to do well in terms of energy consumption. Hopefully, more manufacturers will follow in HMD’s footsteps and take a proactive approach to environmental transparency. Old Nokia was very different to most other brands, they had a pretty high standard in a lot of aspects that other brands don't seem to consider. Good to see that HMD is planning to keep it up.